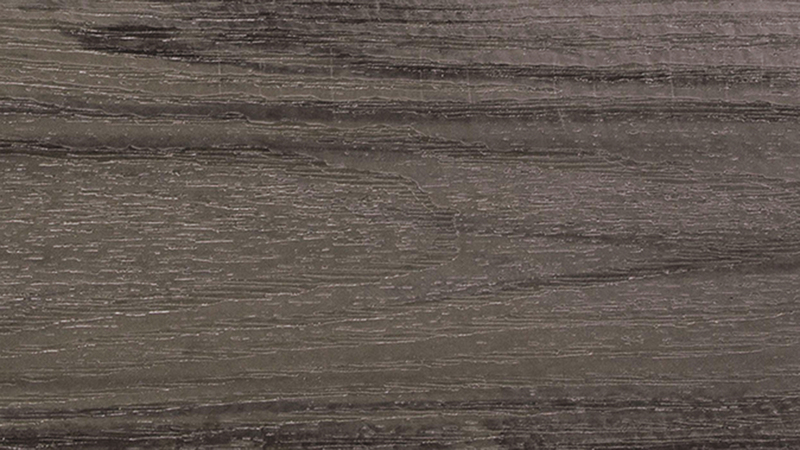 Vertical grain variegation is designed to give Deckorators Voyage, an ultra-low maintenance composite, the trend-forward appearance of the highest-quality wood. Voyage comes in four colors: Sierra (dark gray), Tundra (gray), Costa (golden brown) and Mesa (red brown, pictured). Growing projects mean opportunities for dealers. 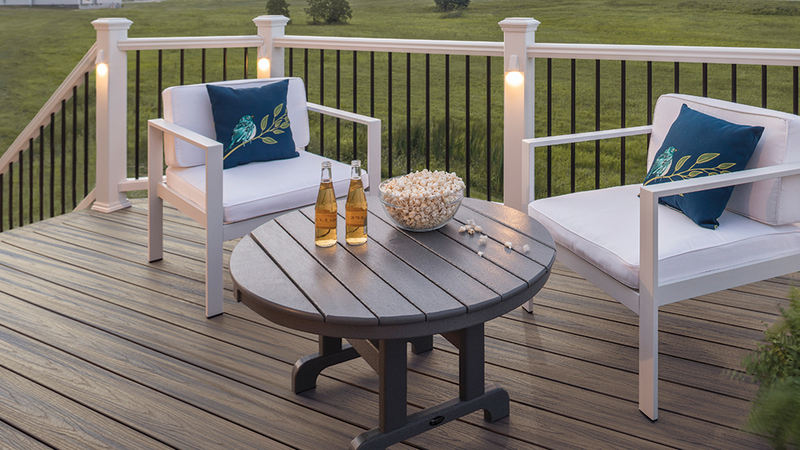 With outdoor living projects growing in popularity and size, decking represents an attractive category for dealers. At the same time, that strength also means plenty of new products and options for dealers to choose from to meet the demands of their market. 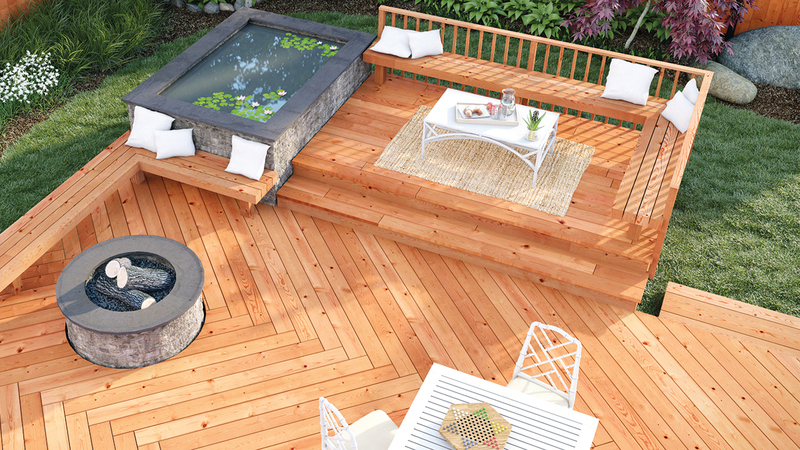 Homeowners want more than a simple deck, says Jase DeBoer, senior category marketing manager for Universal Forest Products/ProWood. From a design standpoint, builders are becoming more creative. 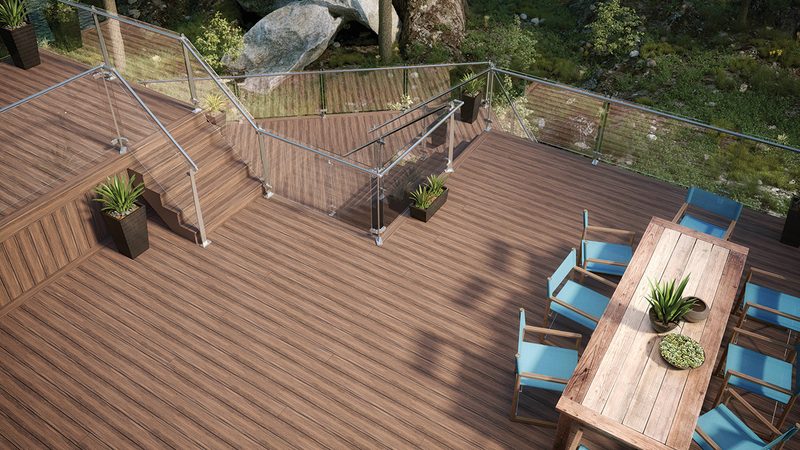 Trex Enhance Naturals composite decking includes five contemporary, multi-tonal hues that feature the streaked looks of natural wood. The new shades of Foggy Wharf, Rocky Harbor, Toasted Sand, Coastal Bluff and Sunset Cove are designed to look like wood, but not rot, warp, crack or splinter. YellaWood CMO James Riley agreed with that sentiment. Vision Decking from MoistureShield is engineered to mimic the look and feel of hardwood floors in an outdoor environment. MoistureShield is seeing similar desires from consumers, says Senior Brand Manager Joey Peters. 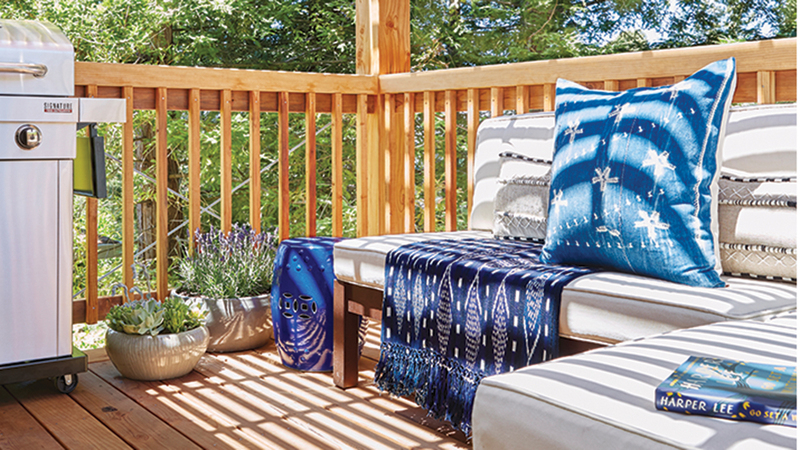 The trend of bringing the feeling and comfort of inside to the outdoor living space continues, says Juliana Rumbaugh, marketing communications manager for Lonza. There is a big movement with home-owners and designers wanting to create truly unique outdoor spaces, says Patrick Barnds, AZEK Building Products senior vice president of product management. With the segment growing, it’s no surprise that manufacturers are introducing a bevy of new products. Many are designed to address the growing demand for lower-maintenance products. “Homeowners today want balance in their life, they don’t want to come home from work and have to keep working on the home. Low maintenance products fit the new lifestyle trends, and those that blend in naturally with their surroundings allow the finished project to really raise the appeal of the outdoor space,” says Steve Booz, vice president, marketing, at Royal Building Products, which produces Zuri Premium Decking. “Low maintenance is at the heart of today’s homeowner—no one wants to put in a new outdoor living space and then have to maintain it year after year.” Zuri decking is designed to replicate the beauty of a real hardwood floor but be easy to care for. Zuri Premium Decking from Royal Building Products is designed to replicate the look of a real hardwood floor, combining the aesthetics of wood with low maintenance. That desire for decks that are easy to care for is also a significant driver of new products from AZEK and its TimberTech brand this year. Vintage Multi-Width Decking, previously available only in a 5-1/2″ width, is being expanded to narrow (3-1/2″) and wide-width (7-1/4″) options. 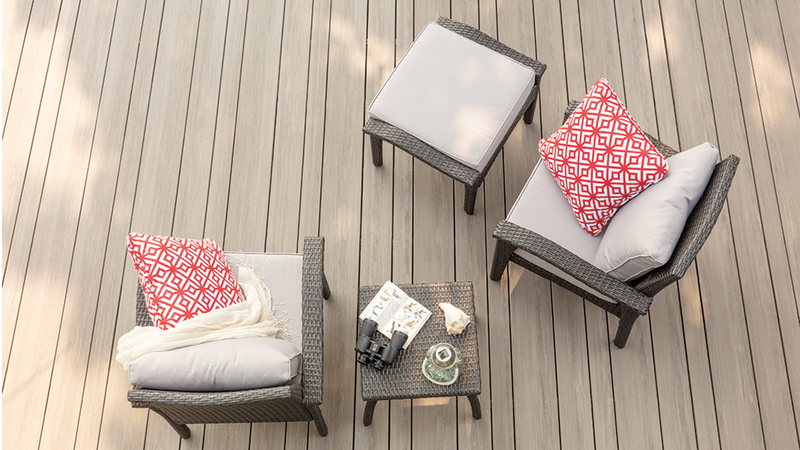 AZEK’s TimberTech Vintage Multi-Width Decking, the first-of-its-kind, advanced, capped polymer deck, introduces narrow (3″) and wide-width (7-1/4″) options to the Vintage Collection, which was previously only offered in the traditional 5-1/2″ width. Wider boards are also now available in the Vintage Porch Collection, launched in 2018, with 5-1/4″ boards joining the standard 3-1/8″ format. TimberTech EDGE offers homeowners a lower-priced product that still delivers TimberTech quality, Barnds says. DuraLife has focused its efforts on making the process easier for dealers, contractors and homeowners by simplifying its offerings. In 2018, DuraLife introduced its Step-Clip fastening system, which it says offers up to 50% faster install times. “We expect to have substantial growth with that product innovation in 2019 as more contractors continue to adopt this groundbreaking installation method, now that those hesitant to try something new have seen and heard about the benefits that early adopters have experienced,” Descoteaux says. This year, Deckorators is introducing a new line of decking using its patented Eovations technology, first released in 2016 in the Deckorators Vault composite decking product line. Lonza offers Wolmanized Outdoor Wood with BARamine technology, a patented innovation that provides improved penetration, broad moldicide protection, and improved resistance to certain aggressive copper-tolerant fungi. Now, with its Deckorators Voyage composite decking, the company has a decking product that replicates the linear streaking of true tropical hardwoods. It is available in four colors: Mesa, Sierra, Tundra and Costa. 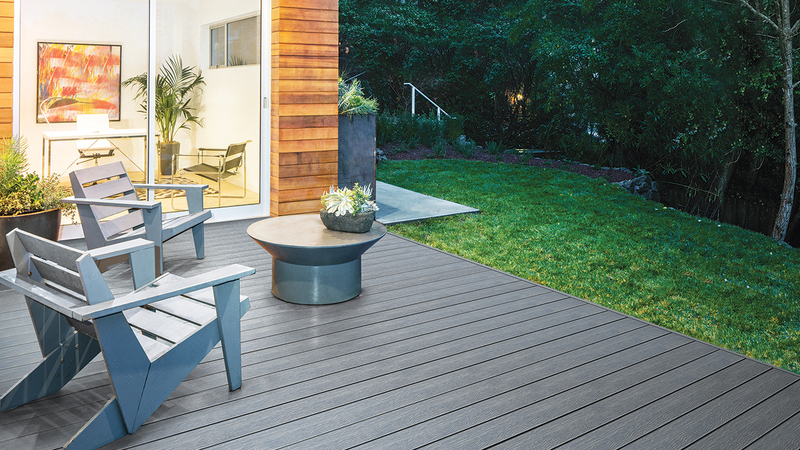 Last fall, Trex extended its Enhance decking line with two new products, Enhance Basics and Enhance Naturals. 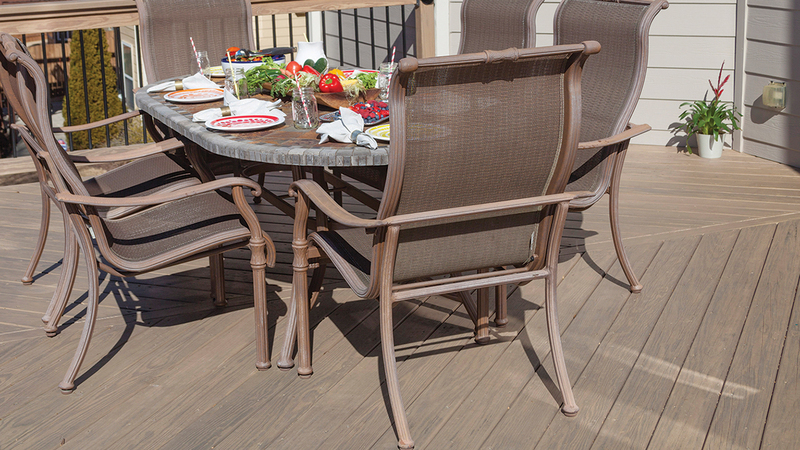 Both products are focused on attracting customers who would otherwise build with wood decking. Also new from Trex is the Enhance Naturals product line, introducing the lowest-price streaked product from the company. The company’s customer research shows that consumers prefer a more natural streaked appearance, but simply don’t want to spend too much time on upkeep, she says. Armadillo’s new Walnut color offers a darker brown for homeowners looking for more vibrant choices for accent colors or even a full deck. Armadillo is also seeing more demand for enhanced colors and increased streaking, says Armadillo Brand Manager Karen Stoos. The company first rolled it out with a few colors and has now expanded the more prominent streaking to its entire Lifestyle line. With many homeowners opting for two-tone decking and picture framing, Armadillo has also released a new darker brown Walnut color which has prompted positive feedback from its distributors, Stoos adds. Armadillo also offers cap stock on all four sides of its boards, something not available from other companies at their price point, Stoos says. The latest products from MoistureShield focus on capturing the trend of bringing the indoors outdoors. 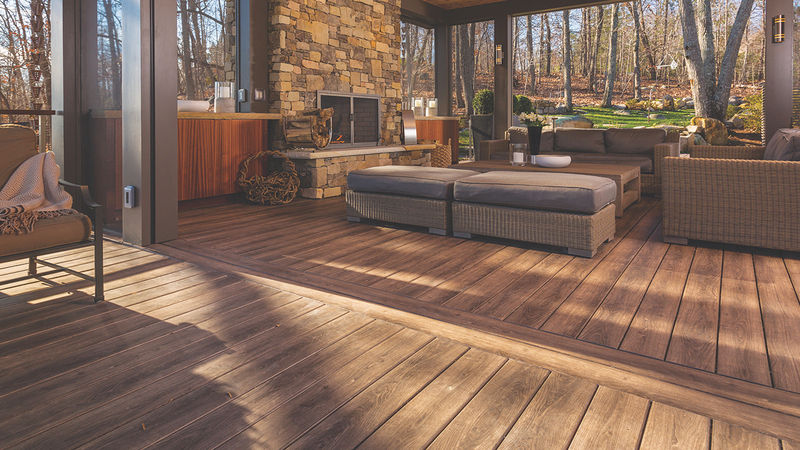 The company introduced its Vision decking in 2018 and is rolling it out to its full dealer and distributor network this year. “Vision is a different board than you would see from our competitors in that it really does mimic the feel of hardwood floors and that’s conducive of a trend that we started picking up on last year, that we continually heard from the builders and from homeowners that they really love the outdoor living space,” Peters says. With the development of Vision, MoistureShield wanted to create a product that had the color and texture of real hardwood, with the durability to handle the outdoors and keep those vibrant colors. Composites, PVC and other alternatives may get a lot of buzz these days, but the majority of decks are still being built out of wood. Natural wood offers many advantages that other materials can’t match, proponents say. 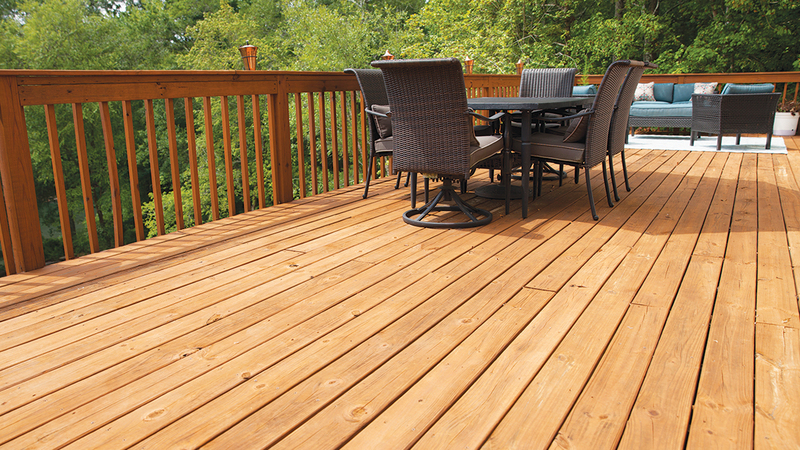 YellaWood has found that homeowners are increasingly looking for decks that offer a higher grade of treated lumber. All lumber is not created equal, and consumers are becoming increasingly aware of that. Viance is constantly innovating its formulas for treatment and preservatives to be more environmentally friendly and more effective, says Director of Marketing Edie Kello. Treated wood offers the advantage of simply being real wood, Kello says. Another innovation is Viance’s DesignWood, which is pre-colored treated wood with the color impregnated into the wood during the pressure-treating process. ProWood is also expanding its color-infused Dura Color line to more markets in 2019. The Southern Yellow Pine that ProWood predominantly uses is the best wood for accepting both treatment and color, DeBoer says. infusing the wood with color throughout the board. Dura Color gives homeowners the look of natural cedar or redwood without the natural fading. Wood also offers a more attractive price point for homeowners, DeBoer says. Wood offers a familiarity and simplicity that homeowners and contractors appreciate, explains Jessica Hewitt, Humboldt Redwood director of marketing. Humboldt is seeing many homeowners expand their outdoor spaces with shade structures to offer more protection from the elements.